Baby, it’s cold outside. You’re invited to join lovers of cats and design on Thursday, Jan. 10 6-8 PM for a special event. 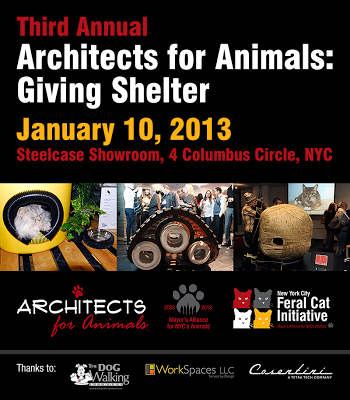 At the event, guests will view an exclusive exhibit of innovative feral cat shelters designed by architects. At the end of the evening, the shelters will be donated to feral cat community caretakers around the city. Come meet the architects, TNR feral cat experts, cat bloggers like Tamar Arslanian of I Have Cat and me. Admission is a $20 donation ($10 for Certified TNR Caretakers) and includes the exhibit, hors d’oeuvres, and drinks. For tickets and reservations (you can pay at the door) RSVP in advance online. I’d love to meet you and hope to see you there! If you can not attend, you can still donate to this great cause by clicking on this link. 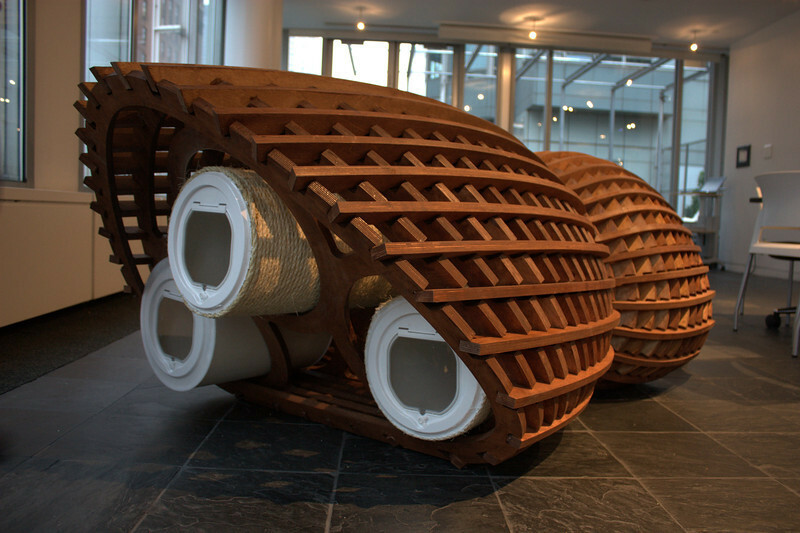 Here are a few shelter design examples from past events. No matter where you live, chances are there are ferals in need of shelter. They don’t need to be fancy or expensive. You can easily make one. Here’s how. Hey There. I found your blog using msn. That is a very well written article. I will be sure to bookmark it and return to read more of your helpful info. Thank you for the post. I will certainly comeback. y0e21o, 6732 pheromonoes [url=http://usepheromones.webs.com/]pheromonoes[/url] [url=http://buypheromones.webs.com/]pheromonoes[/url] zw9fvqkgae40, 5007 pheromones band [url=http://pheromone101.webs.com/]pheromones love scent[/url] pheromonoes. I really wish I could go to this too! I live in Charlotte NC, and that idea would not work down here. To many raccoons would take up residence in these. Granted our winters are nothing like NYC, but it would still be nice for the feral’s to have. Great Idea, Layla, wish I could be there. I am glad I live in central Florida where the cold is not as much of a problem. I use tarps over hedges to make windbreaks and shelters for my feral kitties and their food. 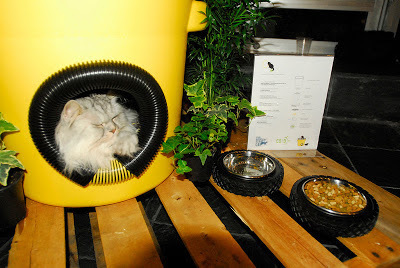 It works great and since rain is the biggest problem here, the natural shelters give the kitties a dry place to eat and stay and don’t usually cause property owners to object. I would like to use permanent, more solid shelters for my kitties, like the ones in the pictures, however, as with any permanent structure, finding property owners that will let you place them on their property can be a problem. 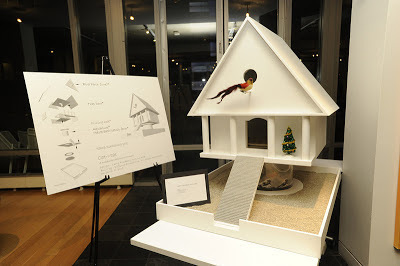 Very creative work, I am sure those New York kitties are going to love their new homes. My auntie who lives in NYC and is an architect may go! Mewmew! So absolutely super duper cool! We wish we could be there. I am going to check out the build a shelter link for my ferals. I’m in the process of getting the TNR addressed and I can now actually actively pet one of the males and sometimes in the right conditions touch the female a little. These guys of mine have come a long way in the past few months and if I had more time to spend with them I think that I could actually home the two that I can touch. I’m still trying!Kitty kisses to all the folks that help cats in any way any where! We feel so very sad for those animals that are forced to live outside in such cold conditions. 8077 online cash advance [link=http://cashadvanceace.com/]nfcu online cash advance vienna va[/link] online cash advance michigan nnn2tnfxpj1wyuj, 3963 [link=http://canada-paydayloans.ca/]payday loan bad credit[/link] 1397 [link=http://www.smallbusinesswebdesign.co.uk]small business web design nottingham[/link]. 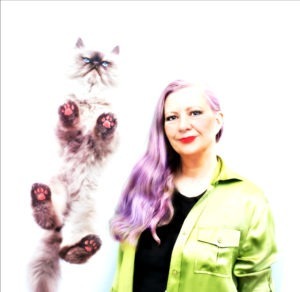 Wow, art and cats–I wish I was joining all of you! It’s so wonderful to hear of this initiative. We wish we were still living in NYC to be able to attend the event! Katie, you used to live in NYC? Cool! Nice Job Layla – can’t wait to see what they come up with this year! Thanks Tamar, can’t wait to see you there! Yay, look forward to seeing you there! Oh what a wonderful event! I’d love to be able to go….I just think it’s wonderful that ferals benefit from all the creativity! My human really wishes she could go to this! We wish you could go too. It would be nice to see your human again.